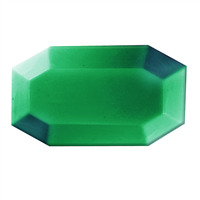 The Emerald Soap Mold looks just like the precious stone, especially when colored with Emerald Green Mica Powder! The facets shine like a real emerald in the light. Bar Depth: 1" Bar Length: 2 1/4"
Use this adorable Gem Mini Silicone Molds to create soaps and bath fizzies inspired by your favorite gems! 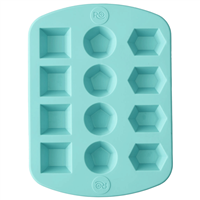 Each mold has 12 cavities with three different gem designs. 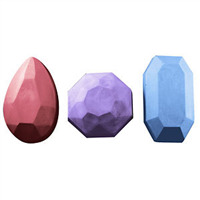 Perfect for creating birthstone soaps! Add some richness and dazzle to your soaps with our 3 Gems soap mold. Included are pear cut, octagon, and emerald cut shapes. 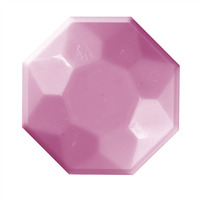 Bar Depth: 1" Bar Length: 4"
The Starburst Soap Mold features a beveled star/flower shape that is inside an octagon. It is unique and shines like a jewel in the light! Bar Depth: 1" Bar Length: 3 1/8"